Asus does it again with the P6X58D-E motherboard! The P6X58D-E motherboard provides you a host of new features and the latest technologies. 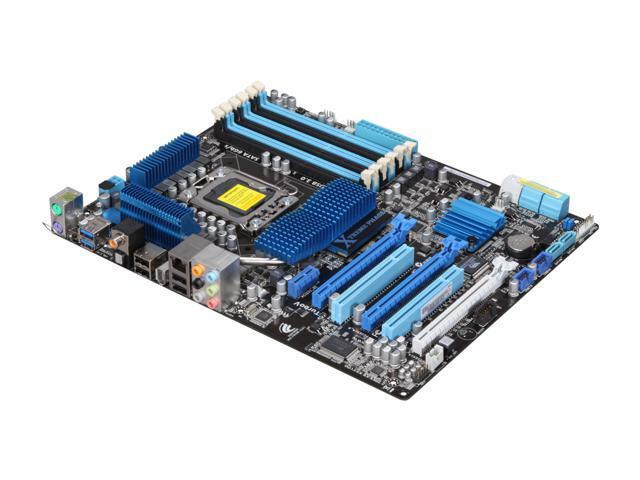 It supports Core i7 (LGA1366) and delivers better overclocking capabilities with less power consumption. It features Triple channel DDR3 2000(O.C. )/1600/1333/1066 memory support and breaks the boundaries to bring you the multi-GPU choice of either SLI or CrossFireX. In addition, TurboV helps you to overclock easily without the need of experience! Asus is an industry leader known for making innovative and reliable motherboards. Bring home the experience and craftsmanship of Asus and build your next system in confidence today! Support Intel Core i7 Based on the Intel X58 chipset, the Asus P6X58D-E supports Intel’s latest generation Core i7 processors in LGA1366 socket, providing unprecedented computing power to match the performance levels you are looking for. Support SLI and CrossFireX With a dedicated graphics engine on Intel X58 platforms to optimize PCIe allocation, the Asus P6X58D-E brings you the multi-GPU choice of either SLI or CrossFireX! Support SATA 6GB/s and USB 3.0 True SATA 6Gb/s and SuperSpeed USB (USB 3.0) support. SuperSpeed USB delivers the transfer rate of 4.8Gbit/s, transfer data 10X faster than USB 2.0 and is backward compatible with all older generation devices. 16+2 Phase Power Design The Asus P6X58D-E adopts the brand new 16-phase VRM power design to deliver high power efficiency and extreme overclocking ability for fully releasing the next generation CPU’s potential. Plus the high-quality power components guarantee a lower temperature for amazing stability and longer lifespan. Asus EZ Flash 2 With Asus EZ Flash 2, simply press the pre-defined hotkey to launch this tool and update BIOS from a USB flash disk before entering the OS. You can update your BIOS only in a few clicks without preparing an additional floppy diskette or using an OS-based flash utility. TurboV Overclocking Tool With Asus TurboV O.C. tool, the Asus P6X58D-E lets you overclock easily without exiting or restarting the OS. The user-friendly interface provides you a simple operation! True USB 3.0 -10X Faster Date Rates! True SATA 6Gb/s RAID Support - Experience the Future of Storage! 3-Way SLI & Quad-GPU support - Flexible Multi-GPU solutions, Your Weapon of Choice! Pros: I bought the motherboard on November 28, 2010 but didn't put together a working machine until sometime in early 2011. It has a 150 GB Velociraptor drive, 2 drives RAIDed as zero, another non-RAID hard drive and a DVD drive plus 24 GB of memory. It was the most complex computer I put together and it booted the first time without problem. I built to edit videos and only used it very occasionally. It wasn't until sometime last year when I first began to have problems. I have been using ASUS motherboards for more than a decade and all the boards worked for years with not a single problem. Cons: I thought maybe the lack of use was the root of my problem, when after a long absence, I bought up the computer just fine and decided to check for Windows and other software updates. I left the machine for a while and when I can back it was still running but nothing I did could get it to respond. I tried everything including removing every component and changing the battery. After several days I was able to get the machine to boot and decide to flash the BIOS to 0803 in case it the previous version of the BIOS had gotten corrupted. I used it successfully in February to edit several videos. Last week I attempted to boot the computer and it was obvious that something had happened to make the situation worse. By removing the battery and the RAM, after a while I was able to get the beeps indicated no memory. Installing one 4B stick, I was able to get into the bios, even flash it, but if I left it at the point where it had booted but could not find and left it for a while, it would become unresponsive until I once again removed the RAM and battery. On one attempted I connected the boot drive and Windows attempted to repair the drive and failed. I was also able to use the ASUS DVD and the computer responded but after a short time the computer would no longer respond. Other Thoughts: Last year, I went to the ASUS website and couldn't seem to find a good answer to my problem. It was only when I found all the comments on Newegg's site that I realized I had bought the only ASUS motherboard I've owned that seems to have multiple issues. Thanks to all who posted their comments. I filled out the form on the ASUS website on Sunday and waiting to hear from them. I wonder if not keeping it powered up 24x7 caused some components to degrade over time.